A unique pair of headphones which have been designed around the style of a paperclip, have been launched. Which have been designed to help you keep your cables in place whilst being worn and tidy when not in use. The Paperclip headphones are equipped with a plastic paperclip style clip which can be slid up and down the cables of the headphones to provide you with numerous ways to keep your headphones in place. As you can see in the photographs above the handy Paperclip design allows you to attach the cables to your bag strap, pockets or collar to keep the cables out of the way when in use, and tidy once the headphones nee to be stored. 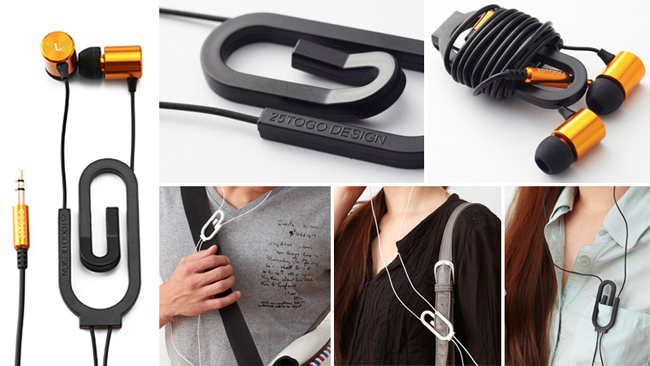 If you fancy a pair the Paperclip headphones are only available to purchase from the 25togo Design Store based in China.